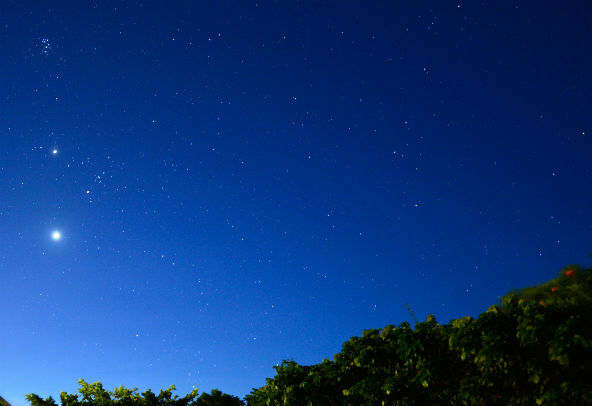 "Stargazing tour" that guides you through the island's exciting environment and treats you to marvelous views of meteor showers and dazzling constellations in special place.Enjoy the seasonal constellation, milky way, meteor shower and southern cross that spread in the clear view of night sky from a tropical island. It will surely become your memories. 【Service operation】Throughout the year. *There is a day of full moon period which is not held. Please contact us for more information. 【Age】3 years old and over. 【Number of participants】From 2 persons. The Southern Cross / late April – middle of June. Saturn / May – August. Alpha Centauri / late May – middle of July. Omega Centauri / June – July. Milky Way / August – September. Andromeda Nebula / October – February. Pleiades / November – March. Achernar / December – January. Jupiter / December – March. Winter hexagon / January – March. Canopus / February – March. *Even if the photographable day, you may not be able to take a starry sky photography depending on the weather conditions.